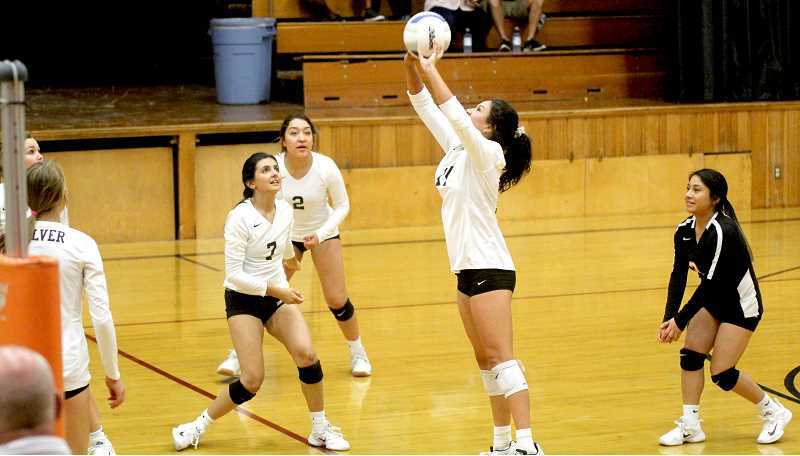 Culver volleyball ready for remaining league schedule against tough upcoming teams. 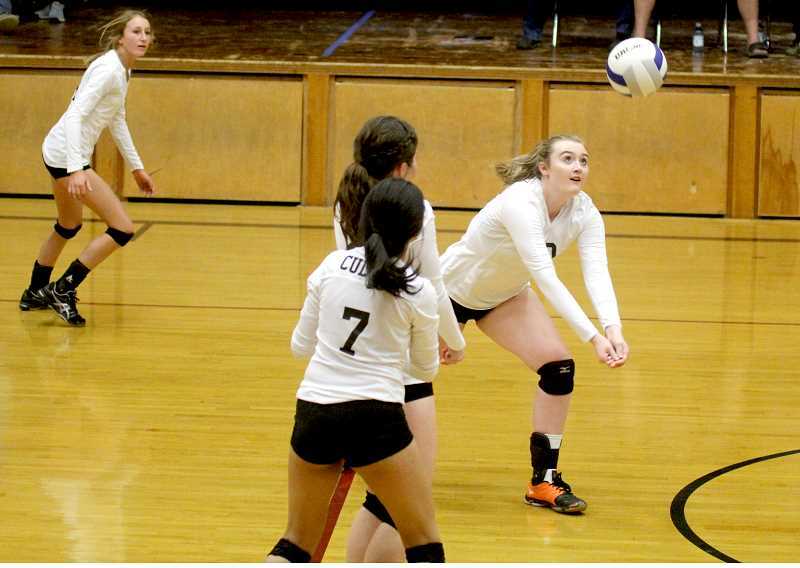 The Culver volleyball program placed third at the McKenzie tournament over the weekend. The teams opened the Sept. 29 tournament right away, with no pool play games, straight into bracket play. Culver started the tournament with a 2-0 win over Days Creek. The Lady Dawgs won two sets, 25-22, 25-22. Culver faced St. Paul next, the only team to beat Culver. The Bulldogs lost to St. Paul 2-0 Sept. 22. "It was very close during the first set, but Bridget (Lopez) went on a really long serving run," head coach Gabrielle Alley said. "She served really tough, which got the momentum on our side and it stayed on our side the rest of the match." In the Days Creek game, Madison Miller led the team in kills with six and Claire Bender with four. Irma Retano finished the game with eight digs and Bridget Lopez with five. Lopez also ended the game with four aces. St. Paul (19-0) beat Culver (19-2) again Saturday. The Lady Dawgs lost 2-0, losing two sets, 25-10, 25-20. Culver would play McKenzie for third and fifth place. Retano led the team in kills with eight, while Bender and Miller had four apiece. Miller was the only Culver player to record an ace in the game. "They are a good team," Alley said about St. Paul. "We played them tougher this time. "The score may have not reflected that, but the points we got were earned. We were getting kills and getting them out of system. It wasn't like we were making errors and giving them points, which I really liked." "A big difference in the game is, one, they have a ton of depth," she said. "They are great team overall, but we just did not win the serve, serve-receive game. We only had one ace and eight missed serves. That is not what we were looking for, especially against a good team." The Lady Dawgs played in their first game of the season that went five sets. They won 3-2, winning their first set 25-16, but losing the next two sets, 25-21, 26-24. Down 2-1 in sets the Lady Dawgs needed to win their next two sets and that is exactly what they did. Culver dominated their next two sets, 25-10, 15-6 and won 3-2, placing third in the tournament. Retano had 19 kills and four aces in the game and Miller had 16 kills. Lopez led the team in digs with 19 and Bender with 16. "It was good to see how well the team could battle through five sets," Alley said. "We were in control the last two sets. We were able to pull away because we had more depth than they did." The Bulldogs also played Colton Sept. 27. The Lady Dawgs ran away with that game, winning 3-0. They won all three sets, 25-17, 25-9, 25-11. 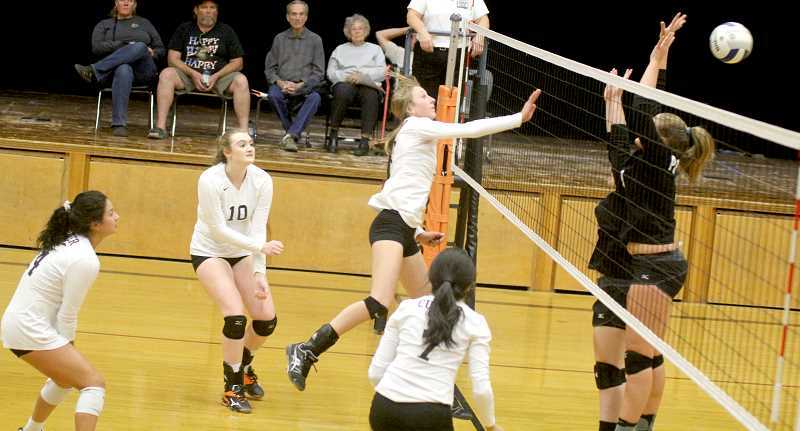 Culver volleyball dominated Western Christian 3-0 Sept. 25. The Lady Dawgs won 25-10, 25-12, 25-16 at home. Culver took control early in the first set and did not look back, cruising to a 25-10 win. In the second set, Western Christian managed to tie the game at 7-7, before the Lady Dawgs went on an 8-1 run, making the score 15-8. Culver went on another big run, that time a 7-2 run, and took a 22-10 lead. A Miller spike ended the second set and the Bulldogs won 25-12. "In order to get all three (dig, set, spike), you need to have a perfect pass to the setter and have to hit in anywhere," libero Lopez said. "If you just set the ball to the outside all the time, teams will start to camp there and block." Up by two sets, Culver was able to play almost all of their substitutes in. The score was close to start, 7-6. A Bender tip advanced the lead to 8-6. "Different coaches have different philosophies," Alley said about playing different players. "The first set, I keep the girls the same, the starters the same, because it is important for their chemistry and to have a solid set together. As far as getting subs in, I think it is great. We have a lot of seniors and they work so hard in practice." The score was 24-15 in favor of Culver and both teams went on a big rally. Players dove, sprinted and fought on every play. The rally was won by Western Christian, but Culver closed out the game on the next play and won the third set 25-16. Retano led the team in kills with 13 and Miller with eight. Lopez ended the game with seven digs and Retano finished the game with eight aces. "I think everyone is hung up on that loss to St. Paul and we did go 15 games before that loss," Alley said. "It happened at a good time against a good team and we practiced well on Monday. Overall, I think it was a good thing for us, we weren't overly discouraged." Culver had a big game against Kennedy (15-1) Tuesday, Oct. 2, after the Pioneer's deadline. "I think we will do pretty good against Kennedy; we're solid," Lopez said. "It will be a tough one, but we like fast-paced games. We need to work on covering and focus. We made a lot of mistakes during the St. Paul game, with hitting errors that were not necessary." "I think the girls know it is going to be a good game," Alley said about Kennedy. "We are going to have some different practices and practice plans and be prepared for their bigger blockers and swingers. The girls are excited for it." The Bulldogs host a tournament on Thursday, Oct. 4. They play Delphian at 3 p.m. and Chemawa at 6:30 p.m.